Electrical power has changed our lives and given us phenomenal freedoms, from talking to people around the world, to going to the moon. But do we know just how much power we are using when we switch things off or put them into standby mode? Energy management consultant John Field says: "Electronic devices like TV or video or stereos, anything which has a remote control, have to be live so you can switch on remotely. "There is nothing to stop you switching it off physically, but if you are going to switch it off with the remote control, then something at the other end within the box has to be live. "It has to have power and electronics operating, so there's a bit of what's called standby power." 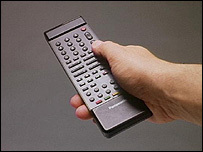 Ultimately, using your remote control can use more power than getting off your backside and pressing the buttons yourself. Standby power can range between 10 and 15 watts, and occasionally beyond. On its own, this is not much. But if you get half a dozen devices on standby, it is the equivalent of a 60 watt bulb. Tracking standby power is difficult, but Mr Field has developed a device to see just how much power we are burning in standby. 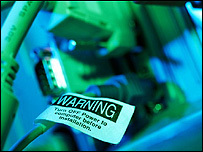 A laptop computer, for example, can be plugged into the mains via his meter which reads the voltage and wattage used. The device is useful because the way the systems draw standby power can be difficult to monitor. A commercial version is being put together by a group called DIY Kyoto. All around the house we bleed power. The modern home is permanently on standby, full of equipment that sits "half on", waiting to spring immediately to life when we ask it to. It means that in one year, in the UK alone, our equipment on standby produces a total of 3.1 million tonnes of CO2. But there is a bigger culprit out there: the personal computer, as Scott Richards from power supply manufacturer Antec explains. "The PC is a special case because if you don't turn it off completely, in other words pull the switch on the back, it's always drawing some kind of power. "And depending on what kind of mode you're in that power can be anywhere between five watts to 60 and beyond. "If a million PC users switched to a more efficient power supply, it would save almost the equivalent of 250 thousand litres of gasoline a day." By the end of 2004 there were 820 million PCs in use around the world, and by 2007 that will top a billion, according to the Computer Industry Almanac. No matter how easy these devices make our lives there is little doubt that they are costing us and the planet dearly. As Mr Richards says: "If you really want to be green with your PC, when you're done using it turn it off."